Another year gone! Time again for contemplating on our sojourn on this planet Earth; conducting annual introspection; assessing and evaluating our thoughts and actions during the year gone by. Time for realizing and assessing why and where we went wrong; accepting and recognizing the areas of improvement, in both, our professional and personal lives; and for setting targets for achievement in the current year. Most of us go through this annual ritual. The tragedy here is that it has become an annual exercise conducted only at the end of the year and not at shorter intervals- monthly or weekly. Ideally speaking, we should make this habit of self-assessment a daily ritual carried out at the fag end of each day before going to bed. But I guess it is difficult to discard old habits akin to our youthful habit of commencing preparation for our final exams at the eleventh hour even after being a witness to the success of the few smart students who devoted moderate but regular hours to study. Before you accuse me of sounding like a moralistic preacher I bring the subject to a close but not without strongly recommending a regular self appraisal which will enable us to make life wonderful not only for ourselves but also for everyone around. Let's bring about a dramatic revival in the fortunes of the SINDHYAT cause. Let's bring about a dramatic change by putting a stop to lamenting over Partition and bemoaning the loss of property and homeland. Let's once and for all stop the wallowing in self-pity and constant harping on the trials and tribulations experienced. Without belittling or undermining the hardships endured post partition, the continuous repetition about those traumatic times, besides imparting historical knowledge, generates minimal interest in the post partition generation which is definitely in the majority today. Let us rather jointly together – the youth and stalwarts of the community asses the current scenario pragmatically and develop a plan for – the need of the hour. How do we, under present circumstances, spread all over the globe, preserve and sustain our heritage, culture and identity while interacting with the rest of the world on professional and social levels on an equal footing as we are already doing now, and quite successfully. 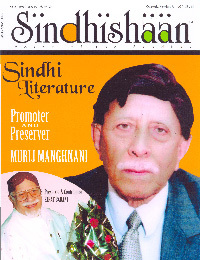 This issue contains two extremely relevant articles – one by Dr. Ram Buxani on the heritage and contribution by the community and the other by Dr. Subhadra Anand suggesting ways and means for the sustenance of Sindhyat which I'm sure readers will find as exciting and thoughtprovoking as I did.